When businesses turn their attention to the assault on their employees’ wellbeing, it’s not surprising they often begin with physical health and ergonomics. In addition to the focus on employee health factors such as obesity, smoking cessation and exercise, many organizations are also focused on workplace ergonomics to prevent injury. The ascent of ergonomics in the 1980s resulted in deep understandings of biomechanics and the importance of providing posture support for workers. In the 1980s when the focus was on maintaining a static, neutral posture for office workers using desktop computers, Steelcase breakthrough research established the importance of dynamic support that mimicked the movement of the spine and set a new industry standard for ergonomic seating. 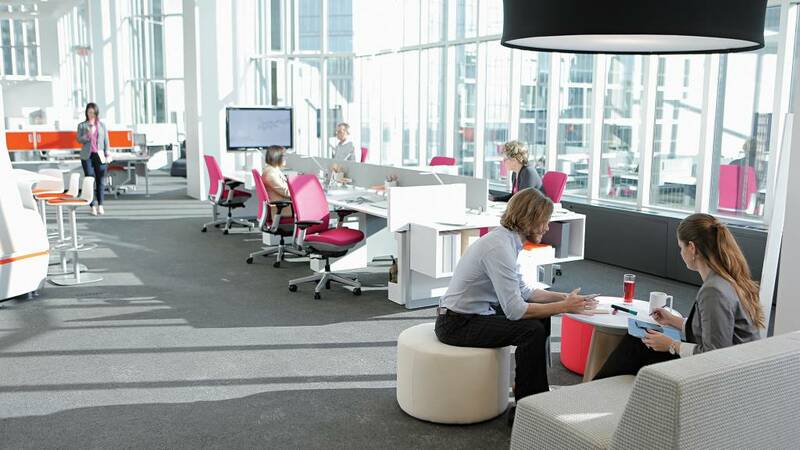 Steelcase researchers went on to study the importance of movement, and began encouraging workers to intersperse standing and walking with sitting throughout the day. Recent studies performed by Marc T. Hamilton (2007), Pedersen (2009) and Stephens (2010) have shed new light on the relationship between long periods of sedentary behavior and pervasive health problems such as weight gain, metabolic syndrome and diabetes. Prolonged static sitting is now known to be physically demanding in its own way — disrupting metabolic functions and weakening the body’s defenses. Even working out in a gym after sitting all day won’t reverse its negative effects. Meanwhile, technology devices are tempting people to sit even longer in chairs that were designed before tablets and other handhelds came into the office mainstream. This is leading to new work postures, some of which are leading to more pain. Butler points out the need for workplaces to be designed for a palette of postures – a variety of work settings where people can choose to sit, stand, walk, perch or even squirm. But Butler warns that not all postures are created equal. People need a range of choices and ergonomic supports. It’s important they have an environment they can move around in since movement throughout the day is important; and when they’re seated it’s equally as important that the chair they sit in supports them in the ways they work today. As organizations face increasingly complex problems, they are recognizing that wellbeing is multifaceted and seeing a link between body and mind. Today scientists are studying the interdependence of our physical and mental states, and how our senses impact cognition. Researchers are finding that our sense of touch — whether a surface is hard or soft, rough or smooth, for example — can impact how we perceive an unrelated interpersonal interaction. Another factor that significantly impacts cognitive wellbeing is noise. It can have undesirable physiological, psychological and behavioral effects, according to Julian Treasure, chairman of a United Kingdom-based consultancy, The Sound Agency. Background noise in the workplace has been found to increase employees’ stress hormone levels and undermine short-term memory, reading comprehension and willingness to engage with others, he says. In workplaces, irritating noise can come from all kinds of sources: air conditioning, obnoxious ringtones, traffic, nearby construction, “pink noise” sound-masking and – especially – from other people’s voices. “Cognitively, there is plenty of research now that shows that in loud offices in particular the most destructive sound of all is other people’s conversations,” says Treasure. Noisy environments tend to only get worse over time, because people start speaking louder as it gets noisier around them (the Lombard effect). As a result of too much noise in the workplace, health and productivity can suffer— the latter by as much as 66%, according to one study that Treasure cites. At the same time, he says, open-plan environments can be very good for many types of work. “It’s one way of working, but it’s not the only way. We need to give people spaces that match what they need to do.” And, conversely, the sounds of silence in the workplace can be too much of a good thing. Pin-drop-quiet places are intimidating, he says, because you can clearly hear every sound in them. The solution, says Treasure, is a variety of workplace environments, each designed with consciousness of sound for the task and the people using the spaces. Work environments need to be designed not just for appearance, but for experience in all the senses. In a time where the term “cognitive overload” has gone mainstream, researchers at The University of California and other institutions are studying how cognitive processes are linked to the body’s interaction with its surroundings. Their work shows how people do better when they can offload cognitive work onto the environment because of limits on attention or memory. At its most basic level, physical environments equipped with whiteboards make it easier for people to offload information by giving them a place to make their work visible. 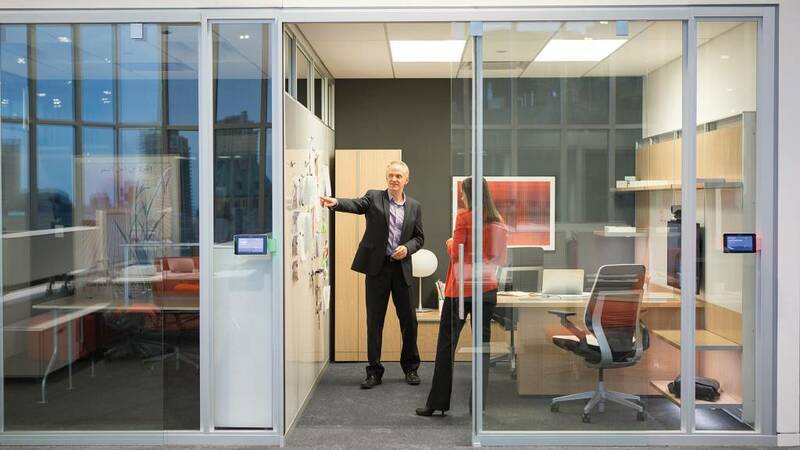 Going further, researchers at Steelcase are exploring how technology-enabled architectural elements and furniture allow the physical environment to take on routine tasks, such as anticipating when to turn on equipment. Being able to offload some functions onto the environment can free up brain capacity to tackle complex problems. Gallup’s global wellbeing study explored a powerful body/mind connection: engagement. Being disengaged, they found, is a leading indicator for a subsequent diagnosis of depression, as well as an increase in total cholesterol and triglyceride levels. Perhaps even more alarming for businesses is that Gallup found more than two-thirds of workers around the world are simply waiting for the workday to come to an end; they become increasingly happier the closer they get to leaving work. So not only are disengaged workers not as productive, they’re likely to cost an organization more because of the physical and mental health issues associated with stress. Everyday stressors can create negative emotions that put humans in a constant state of being on guard, conditioned for a “fight or flight” response. Ultimately, cortisol and other hormones that are released during stress tire and deteriorate the body and mind. 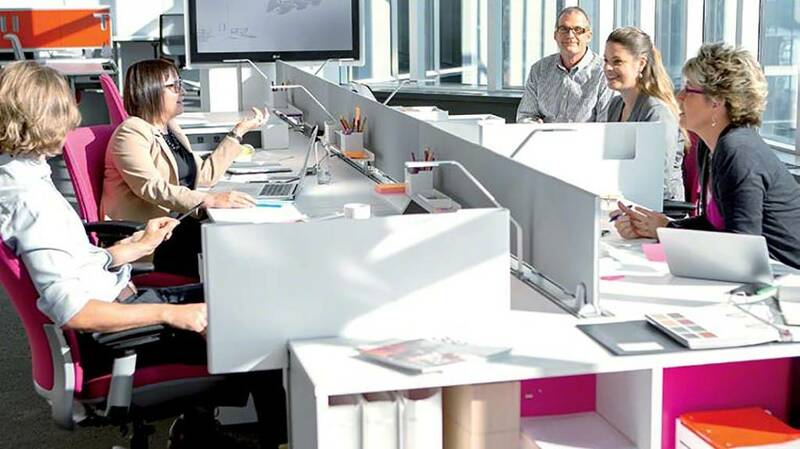 Given the vast amount of attention that has been given to physical dimensions of wellbeing, Steelcase researchers decided instead to focus their attention on the aspect of wellbeing at work that many organizations feel uncomfortable talking about – emotion. How people feel has a significant impact on both their health and their work. As people’s work changes, their needs change. And as needs change, work environments also need to change to remain supportive. The evolution of offices as places primarily for process work to places for creative work has profound implications for wellbeing. Creative work is all about making connections, being open to new ideas, taking risks and experimenting. These behaviors are impossible in a stressed state of mind. 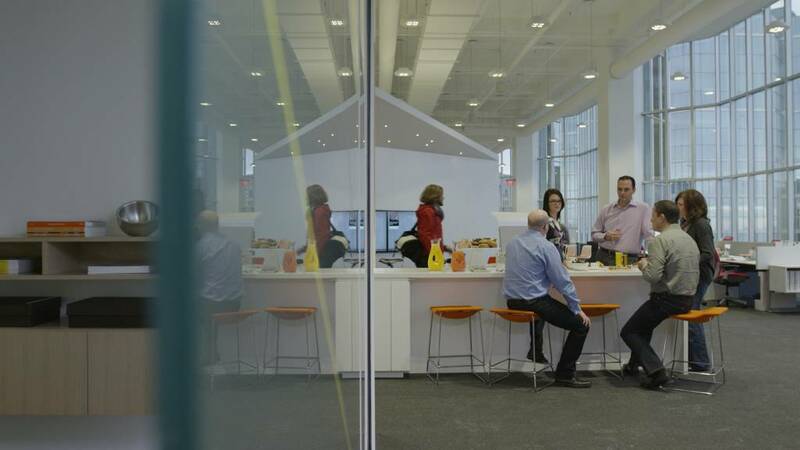 For creative work to thrive, the workplace needs to be a supportive and positive environment. 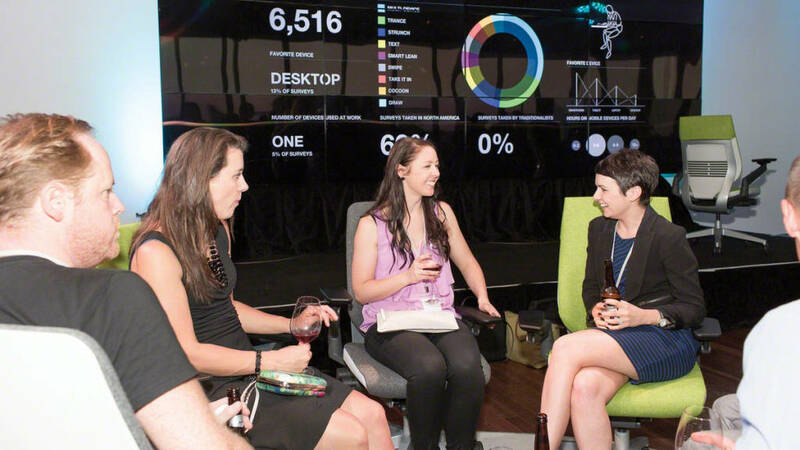 For creative work, the workplace matters more than ever, and it needs to do more than ever. Most companies, however, still rely mostly on hunches or trial-and-error approaches to workplace wellbeing. A gap in wellbeing research has been information on the impact of the work environment beyond ergonomics, air quality and other obvious factors. Lacking has been a coherent set of insights into the factors that are important for wellbeing and a plan of action for how organizations can give those factors substance in their spaces. The Steelcase team’s objective was to help fill that gap. “The premise of our research has been that we don’t want to just understand wellbeing; we want to improve it,” explains de Benoist. Does Your Work Environment Undermine Wellbeing? At a recent roundtable conversation on the topic of about the future of work, PopTech curator Andrew Zoli asked a packed room of people where they do their best work. The answer: not at work. People described great cafés, home offices and libraries that helped them to feel energized, focused and engaged. Only one person in the group praised her company’s recently redesigned office as a place where she felt a sense of purpose and vitality. This conversation echoes many other discussions that are taking place online and in a variety of forums where people are passionately debating what the best work environment is for actually getting work done. Authors Jason Fried and David Heinemeier Hanson recent book “Remote” suggests people don’t need offices at all. Business leaders disagree. While working remotely is a viable option for some workers, business leaders understand that it’s important for employees to feel connected to each other and with the purpose of their organization. Coming together in the workplace is what allows them to do that. The key is to create workplaces that are designed to be destinations that people want to be in because it helps them do their best work. 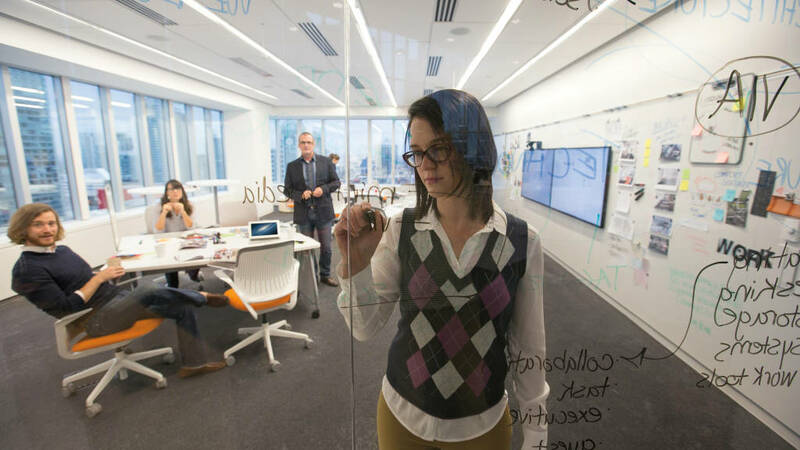 Steelcase’s ongoing research sheds light on what workers need to be creative and productive, and identifies some of the most frequent workplace culprits. Leading organizations can make a significant impact – or hinder – their employees’ wellbeing by focusing attention on the physical environment. With a little effort, people can actually leave work feeling as well, or even better, than when they came in. and yet more than half (51%) have no place to go within their workplace. 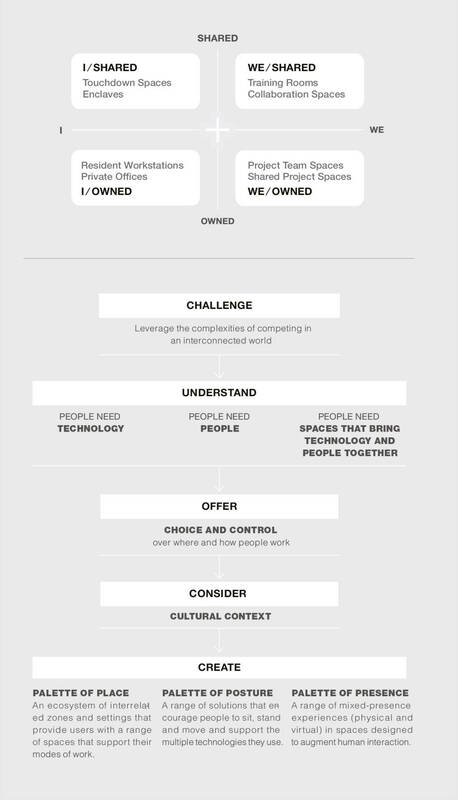 This framework provides a methodology for creating and assessing a workplace designed for an interconnected world. It recognizes that people need to do both individual “I” work and group “We” work. It also breaks the paradigm that all individual spaces should be assigned or “owned” or that all group spaces should be shared, and instead offers the choice to work in a range of spaces that best supports the work that is being done. The range of spaces in an interconnected workplace need to support focused work, collaboration, socializing and learning, and consider the physical, cognitive and psychological needs of people. 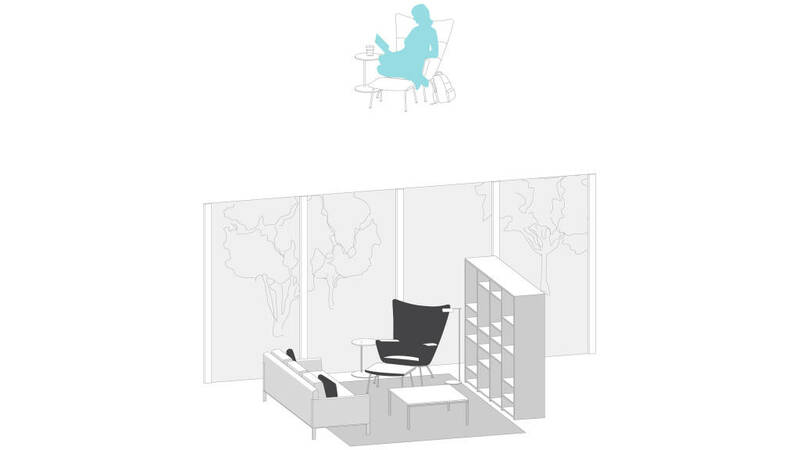 The Steelcase team’s research synthesis identified six dimensions of wellbeing that can be impacted by the design of the physical environment. 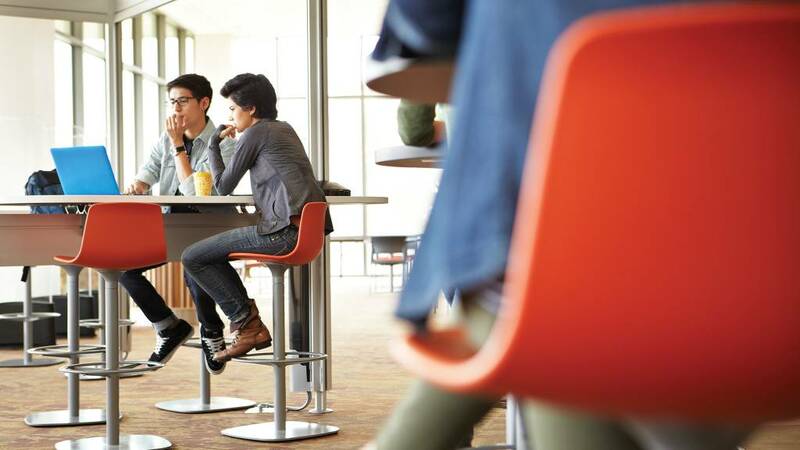 The foundational concept that links all six dimensions is what Steelcase refers to as an “interconnected workplace,” and which offers employees choice and control over where and how they work. An ecosystem of interrelated zones and settings that provide users with a range of spaces that support their various modes of work. 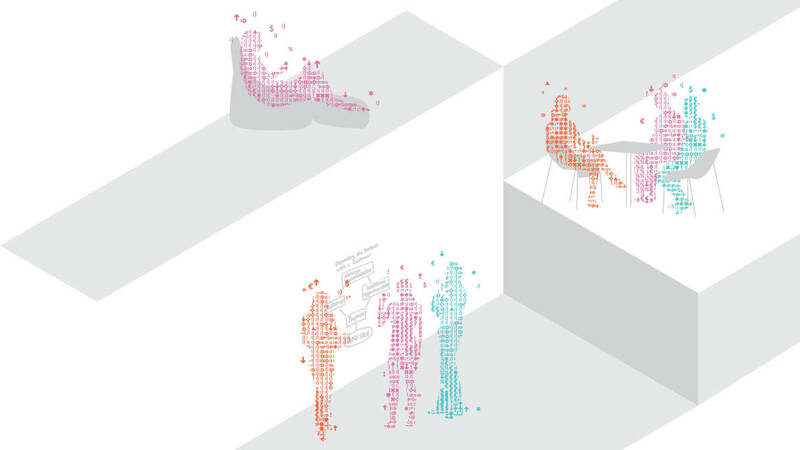 A range of solutions that encourage people to sit, stand and move while supporting the multiple technologies they use. A range of mixed-presence experiences (physical and virtual) in workplace destinations designed to augment human interaction. This setting offers inspiring views and promotes movement through the environment, encouraging users to select the right place for them to work at any given time. 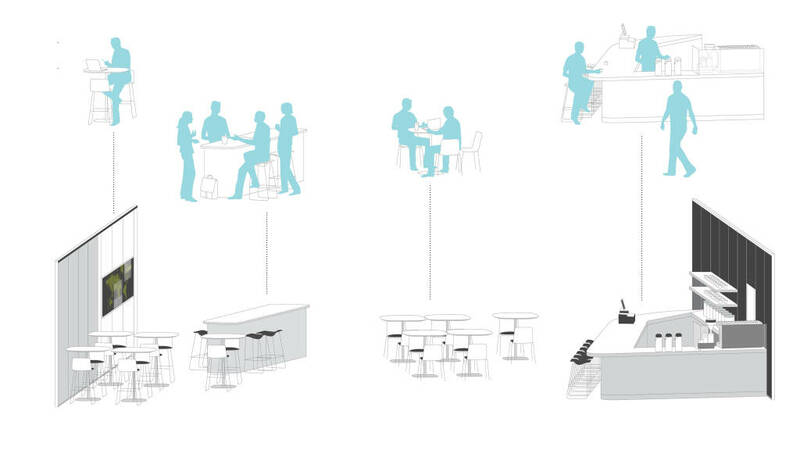 The informal social setting supports connections and provides nourishment. Optimism is more than just expecting positive outcomes in various domains of life. It is about being on a quest for discovery, eager to try new approaches versus being overly risk adverse. It means interpreting and remembering events in a positive light, as well as creating enjoyment in the present and seeing possibilities for the future. Researchers at the University of California recently found that part of our optimism, self-esteem and sense of mastery (the ability to affect a positive change in life) is genetic. But, they also noted that genes are not destiny and that activities, relationships and environment can have almost as much impact in the equation. Emotions can play a significant role in our tendencies toward optimism. Fear breeds pessimism. Optimism is critical to the type of work that organizations need today: creativity and innovation. It influences a wide range of behaviors such as seeing the big picture, exploring ideas, being open to others, taking more risks and facing difficult tasks. It also makes people open to change. Understood in this way, optimism has important implications for an organization’s agility and resiliency. Because of this, optimistic employees tend be more productive employees in today’s economy. Empowering workplaces support continuous experimentation and show the legacy of the brand and organization in positive ways to reinforce progress and possibility. “Workers need to feel a sense of individual influence and control over their environment, versus feeling quashed by standardization and rigidity,” advises de Benoist. Allow choice and control over where and how people work. Create spaces that allow personalization and individual customization, instead of tightly enforced workplace standards. Offer settings and affordances that help employees feel supported in their work. Design for transparency, so people can see and be seen, and build trust. For application ideas designed to support physical, cognitive and emotional wellbeing in the workplace see the Wellbeing Thoughtstarters. This owned space allows for both individual focused work as well as 1:1 connections. 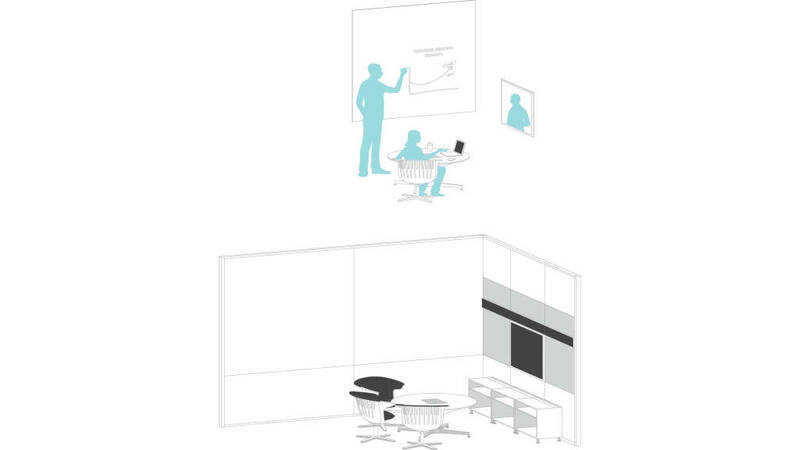 Users can make work visible using vertical surfaces, connect with remote team members via telepresence technology or work alone. 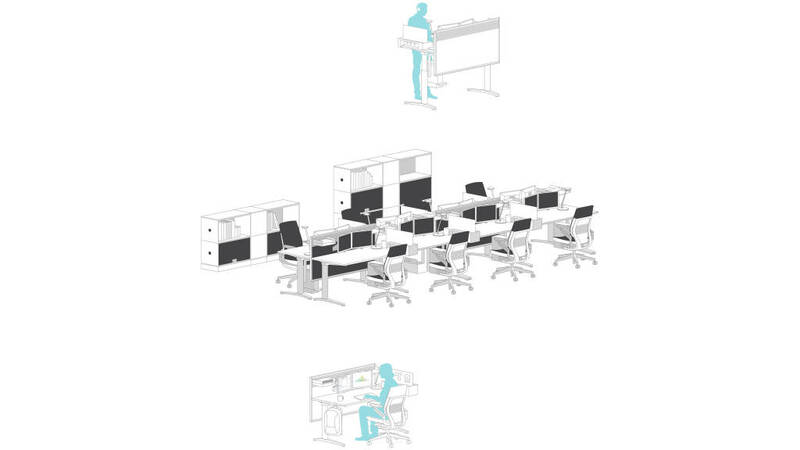 “Workers need physical spaces that help them manage the cognitive overload of their daily lives and be fully present in the moment,” notes de Benoist. Create spaces that help people connect with others one-on-one and eye-to-eye, and not just through their technology devices. Design areas that allow workers to control their sensory stimulation and choose if they want to amp it up or down. Offer places that are calming, through the materials, textures, colors, lighting and views. 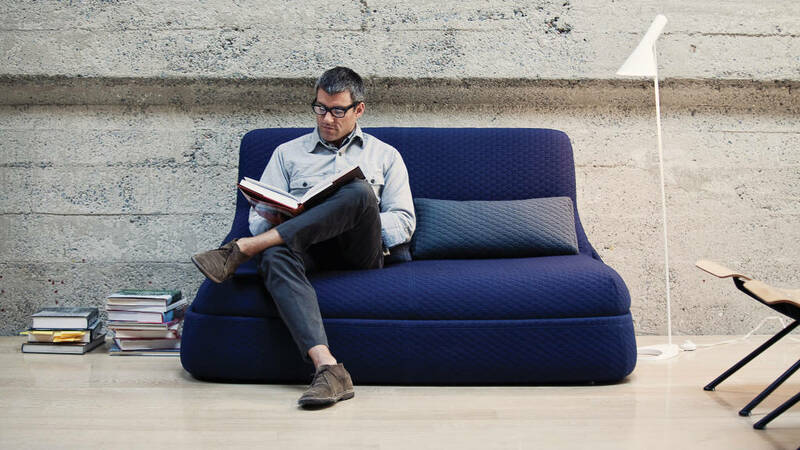 This lounge allows coworkers to connect formally- whether it’s for socializing or to share ideas. The home-life environment allows people to be themselves. Mobile workers can easily connect with their peers and feel a sense of belonging. The bench supports a range of user needs, from focused work to collaboration to touch-down tasks. A meaningful life means feeling connected to other people. Social connections at work are sustaining, and feeling useful to others is a powerful way to generate positive emotions. Psychologist Abraham Maslow positioned belonging at the third level of his famous hierarchy of universal human needs, preempted only by basic physiological needs (food, water, sleep, etc.) and safety/security needs. Numerous studies and experiments have led to the belief that humans are genetically wired to need one another, and Gallup data provides empirical evidence that having close friends and positive interactions at work significantly increases engagement with the organization. Relationships anchor people’s commitment to an organization, its brand and its purpose. Without meaningful connections to people, organizations can seem anonymous. Because of this, mobility, alternative work strategies and telepresence across geographies must be intentionally crafted so that employees don’t lose their sense of belonging. “Mobility can be positive because you’re giving people flexibility, and videoconferencing is fast becoming a fact of everyday work, especially for global teams. But it’s important to ensure that people have meaningful connections to others and understand that, wherever they are, they are valued in the organization. Employees need to know they are integral participants in something larger than themselves and others in the organization care about them, ” says Arantes. Create entrances that are welcoming with visible hosting for people who don’t work there routinely. Provide ample and well-equipped spaces for mobile and resident workers to work individually or in teams. Offer videoconferencing configurations that allow remote participants to see content in the room and on the walls, and to hear everyone equally. This immersive team space gives members a place to share and display ideas, thoughts and ongoing work. 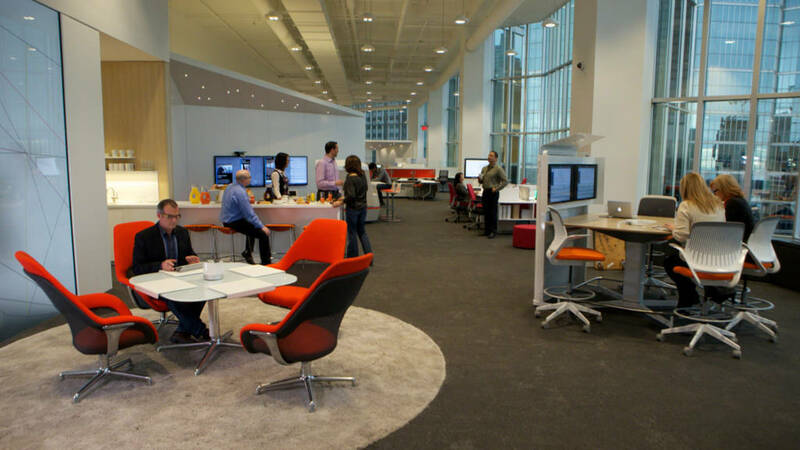 The space provides both analog and digital tools for collaboration and information sharing. People need to use their strengths, understand their impact and see how they contribute to organizational goals. Edward Diener, nicknamed “Dr. Happiness” and a senior scientist for the Gallup Organization, distinguished that the so-called “calling orientation,” in which people are passionate about what they do, is intrinsically the most rewarding. A sense of purpose helps build a resilient enterprise based on trust and collaboration. It infuses “yes power” throughout an organization, says de Benoist. “Brand isn’t just for the client,” says Arantes. “The brand is also for the people inside the company to have a meaningful understanding of what the brand stands for and be mindful of it in their everyday work. Include spaces beyond the lobby that reinforce the brand, purpose, history and culture of the company. Leverage vertical real estate to make thinking and progress visible. Use technology to display real-time information. 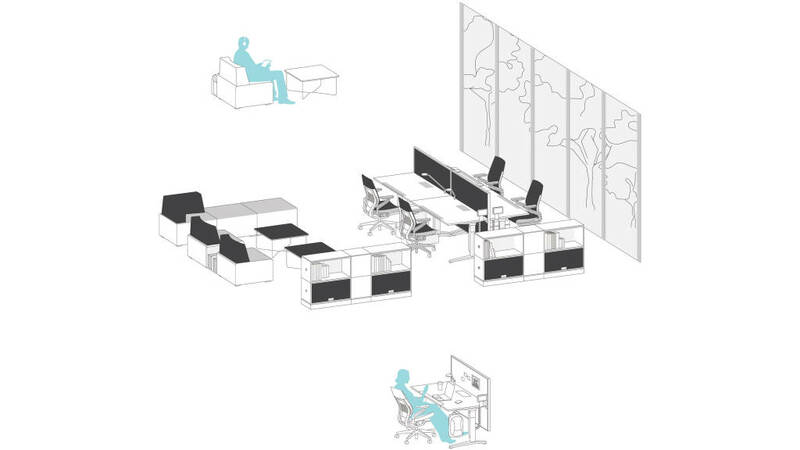 Create an ecosystem of spaces that give people choices and empower them to work productively alone or together. This environment provides a variety of settings giving workers the freedom to choose where and how they work. The open social setting builds trust and provides opportunities to connect with others. IBM’s CEO Study notes that the move toward a more collaborative, communicative, creative, flexible, and ultimately more innovative organization is not something they are delegating to HR. They see the challenge as so critical to their business performance that they plan to engage the entire C-suite and personally lead this shift. To impact this goal, leaders at all levels of the organization will gain greater traction if they incorporate a focus on wellbeing into their strategy. Employers make a significant investment in people and expect a positive ROI over time. For those who understand that their employees’ wellbeing is imperative for bottom line success, the potential return is high. Conversely, it’s shortsighted and risky to shortchange people’s potential with inadequate, unsupportive or uninspiring work environments that undermine their wellbeing. Wellbeing is a competitive advantage in today’s business world. 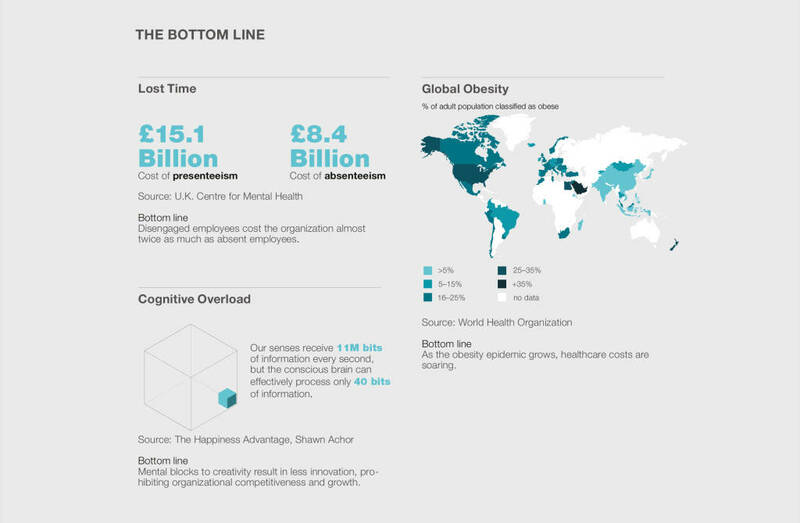 Wellbeing is a competitive advantage in today’s business world. To achieve it, workers need mental and physical health, nurtured by a supportive environment that gives them the emotional capacity to interpret and experience events in a way that leads to productive, positive actions. The best places help people engage deeply in what they do by giving them what they need for wellbeing at work. The results can be self-perpetuating: a systemic sense of wellbeing that easily becomes positively contagious, amplifying the performance of individuals, teams and the entire enterprise. Attaining wellbeing at work is about creating and sustaining a healthy physical and mental state over time in a supportive physical and social environment. No single space can do this alone. 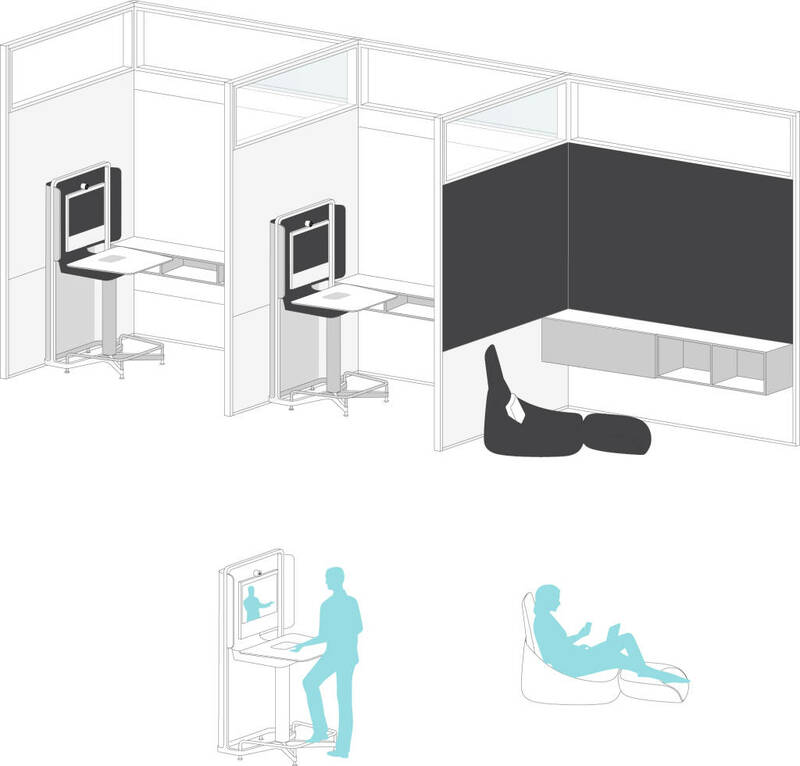 Provide spaces that can be easily modified by individuals and teams to encourage experimentation, spark imagination and creativity, and expand possibilities. Create environments that support focus and minimize distractions for all tasks by providing a diverse range of settings that facilitate individual concentration, 1:1 connections, collaboration and team focus. Allow individuals and teams to express their personalities through space by empowering them to select environments that best suit their preferred work styles. Encourage employees to display personal items in workstations and on their computers, tablets and smartphones. Provide spaces that encourage personal and professional connections. Ensure that spaces designed for users to connect with one another are intuitive and easily accessible for both co-located and distributed teams. Embed elements such as a media wall in the space to reinforce the importance of connections and the organization’s commitment to employees. Accommodate both co-located and geographically disparate teams by creating a palette of places and presences — i.e., settings for both physical and virtual collaboration. Provide social spaces to reinforce the importance of fun and social interactions and the company’s commitment to encourage these behaviors. Design spaces that encourage movement. Create a variety of indoor and outdoor spaces that offer posture choices (sitting, standing, perching, lounging) and encourage walking to create physical and emotional energy, stimulate the mind, improve alertness and improve focus. 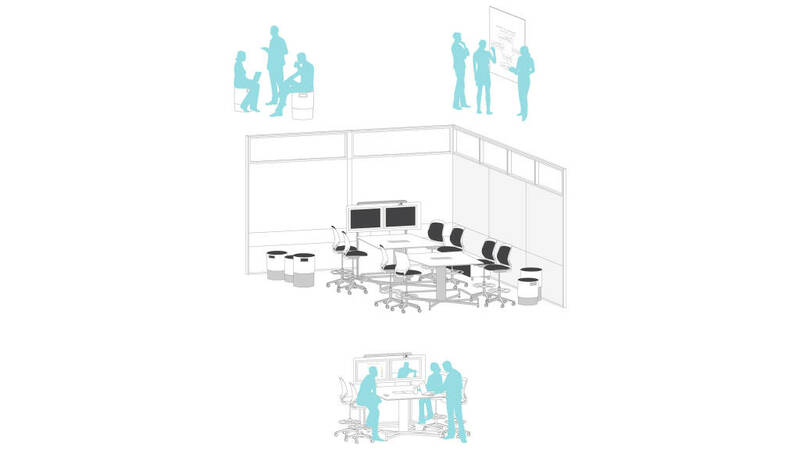 An immersive, shared space that supports project teams and small groups in analog and digital collaboration, content sharing and idea generation. Well-appointed to meet user needs around tools, hospitality, amplification and posture options. 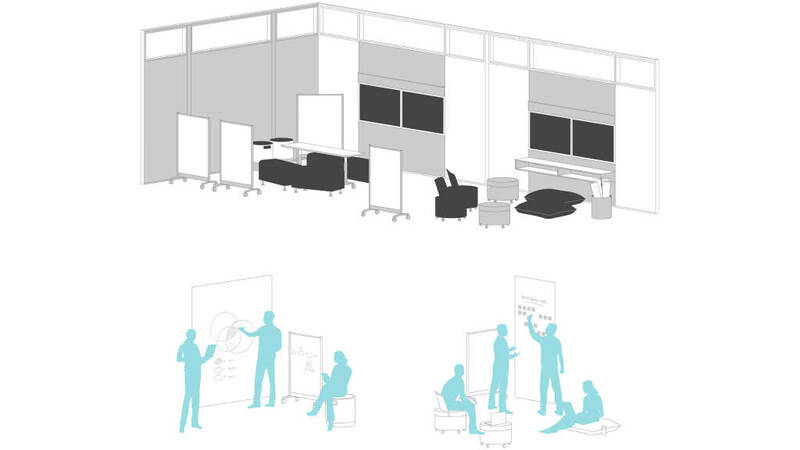 Architectural walls are leveraged as planes for analog and digital collaboration. Chairs swivel so workers can switch eye contact quickly between each other and multiple information displays. 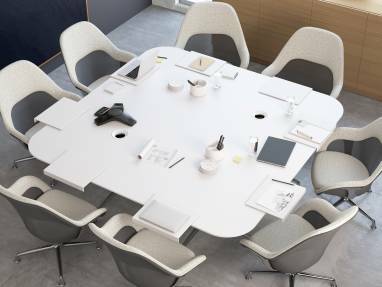 Well-situated high-definition telepresence and furniture amplifies the conditions for innovation by augmenting the quality and quantity of interactions for both physical and virtual participants. 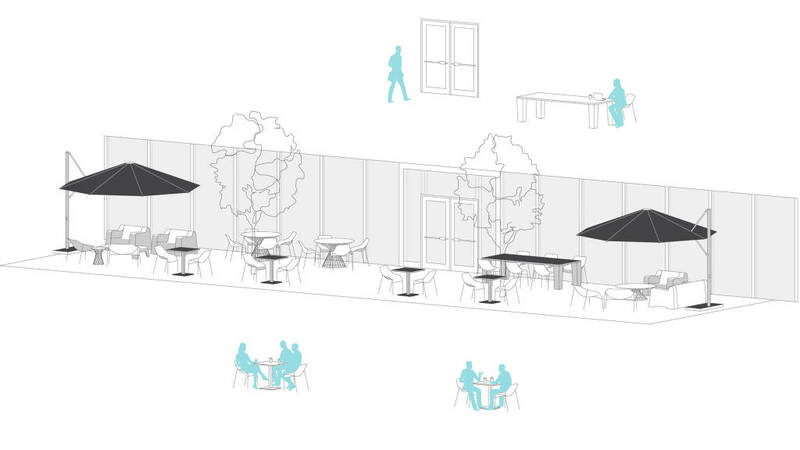 Moveable seating provides informality and postural change. Using walls as vertical planes for displaying information increases mental capacity for dealing with complex issues. An informal and social setting to support connections, built trust and provide nourishment. Provides opportunities to connect socially and hosts mobile workers graciously to facilitate a sense of belonging, promote healthy professional relationships and bridge presence disparities. There is a variety of settings for socializing or meeting informally. 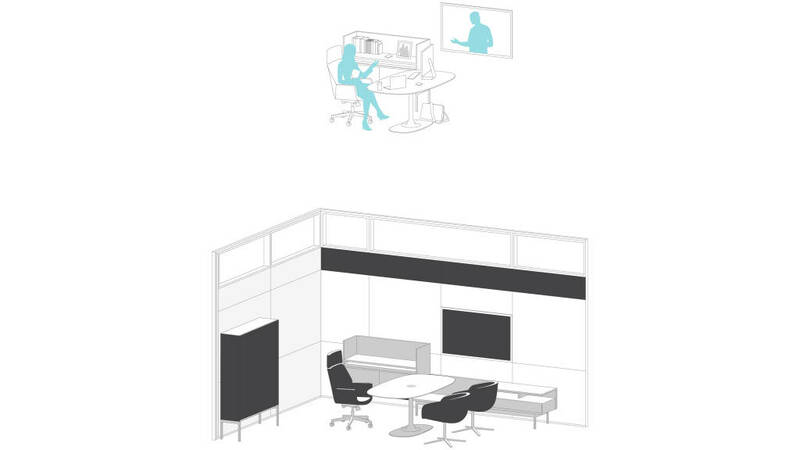 An area for mobile users with a variety of settings that welcome and accommodate focus and collaboration. A palette of place and posture options provides solutions for mobile and geographically disparate users to feel a sense of belonging, community and connection to the brand and culture. Shared spaces welcome users and allow for personalization and self-selection, giving a sense of pride and temporary ownership. An owned space that provides the ability to express one’s self and display personal items and professional artifacts. Users are empowered to utilize the space in the best way to support their individual needs through amplification, making work visible on the walls or providing solitude for focus. 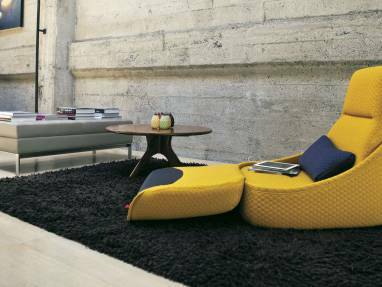 Acoustically sealed, the space supports quick switches from individual focused work to 1:1 connections and interactions. A setting that offers inspiring views, access to nature and a palette of place, postures and presence options. Promote movement through the environment by encouraging users to select the right place for a given task. A variety of settings support user needs throughout the day, from focus to respite to collaboration. An informal place that enables people to be alone with others nearby or have informal interactions within the hum of surrounding activity. Provides great views to the outdoors and displays of organizational artifacts. Those who aren’t comfortable in a high-sensory environment can come here to dial down the stimulation around them. A space to fine-tune imagination, spark creativity and foster critical thinking. Inspire, engage and support evolving innovation processes and serve as a symbolic and tangible expression of a company’s commitment to a culture of innovation. Small, private spaces that provide respite, focus and rejuvenation. Easily accessible with good visual signaling. Owned individual space with supportive tools and personal control. 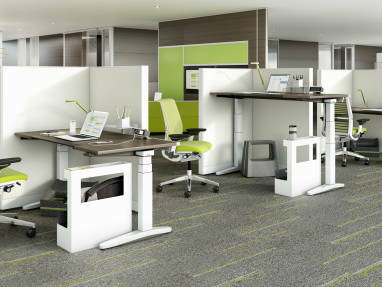 Users can personalize their workstations and adjust for comfort. The overall zone supports a range of user needs, from focused work to collaboration to touch-down tasks, allowing the worker to choose where they feel most productive. Personal storage cubbies and hooks at each workstation reduce clutter and act as a boundary between workers. 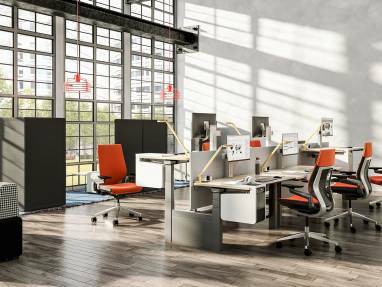 Height-adjustable worksurfaces promote healthy movement and mental alertness, while also recognizing workers’ individual physical needs and preferences.